What a super easy yummy recipe! I will have to remember that NEXT time I have mushrooms in the house. Thanks for visiting my blog. 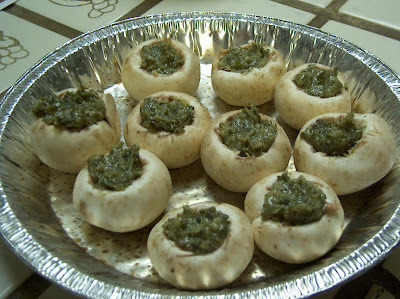 I love that pesto sauce, but I just can't do mushrooms! I do try them occasionally because I know tastes change, but they are still a no go! Thanks for visiting me. To answer your question, it was machine embroidery on the skirt. I'm nowhere near that good by hand! Wow! Now I know where to come to get some yummy recipes! Cool! Even I think I could pull these off! I wanted to thank you for visiting my book blog and for your recommendations! They sound really good and I'm going to check them out! I'm glad you found some books that intriged you too! Ok those look absolutely delicious I am now hungry! My dh and I love mushrooms will have to try this! Thanks for stopping by today on my blog! I didn't make up the homemakers prayer no..but it is definately one I am printing out and putting somewhere I can read daily..good rules to go by! Berji's Domain, what a fun sounding party! I'd love to hear more, especially about the fondue part :) I love fondue! Thank you for stopping by! I like your theme blog all about recepies. For myself it helps having a theme to give myself something to talk about! I'd be all over the place if I didn't talk about my projects! Keep on going with your quilting; it doesn't matter if it would win prizes or not - the quilts are still special to those you love! This is terrific. You can never have too many of these recipes for quick but super appetizers! I got my book yesterday! I LOVE IT!! You are so royalty! I am enjoyoing all the wonderful information in the book. Bobbi Jo, I'm so glad you got a copy of the book and that you love it! Makes this fellow queen very happy. And thank you for the shout out on your blog today :) I need to try some of the yummy looking recipes on your food blog. Do you have any favorites to recommend I start with? My hubby would like these though! That does sound good. I SO WISH that my husband did not have an aversion to mushrooms. I just don't get it. Thanks for stopping by my Tempt My Tummy Tuesday. Oh my gosh, I would not have thought of this. I keep homemade pesto in the freeze at all times. Thanks! Wow! Your blog is making me drool! These were a hit for our WWF night!